Fabric and PVC stretch ceilings are becoming increasingly popular on the market today and it’s no wonder since they are easily and quickly installed and come in many varieties. However, one type, in particular, stands out among all the choices, and that is the acoustic stretch ceilings. These are the same stretch films and fabrics that we are all accustomed to seeing. But, the materials are slightly different: they are perforated throughout. The perforated surface combined with an acoustic backing perfectly absorb sound vibrations. Such ceilings don’t just prevent sound waves from passing through them; they also stop them from spreading further. The sound wave is partially reflected by the ceiling surface, but part of it is absorbed by the acoustic ceiling system. – Cost-effective solution for large surfaces. If necessary, installation can be done yourself, but it is better to entrust this work to professionals. The fabric or film may be damaged if improperly installed. Most varieties of acoustic stretch ceilings are moisture-resistant, so don’t worry about high humidity in the room. However, this does not mean that the surface will easily handle contact with a large quantity of water. You can wipe the surface with a damp cloth, but it is better to limit the exposure to water. How to choose the right acoustic stretch ceiling? By now you’re probably aware of the dual purpose of acoustic stretch ceilings: aesthetically they create a nice smooth ceiling surface, and they also provide a relieve from the annoying noise. But did you know there are different types of acoustic stretch ceilings? Perhaps the most important aspect when considering an acoustic stretch ceiling is your acoustic objective. These ceilings can be useful in resisting both the penetration of external noise into the room (soundproofing) as well reducing the acoustic pressure created by the sound waves inside the room (reducing indoor noise). This type of ceiling has holes that are invisible to naked eye, with a diameter of no more than 0.1 millimeters. The perforations have an interval of 2 millimeters. The thickness of these fabrics is about 0.5 millimeters and the density of the perforations is 250,000 per square meter. The holes in these membranes are arranged in a strict geometric order, but, the spacing for the width is 9 millimeters, and for the length it is 15 millimeters. With fewer holes per square meter, films of about 0.17 millimeters thick are still very effective. There are about 15,000 small holes per one square meter of this material. Due to the uniform arrangement of the perforations with the spacing of 8 millimeters, there are more holes on a piece of this PVC film than in the same size as one of the previously mentioned type. The density is about 25,000 punctures per square meter. Such a membrane has better sound absorption potential than the film with fewer perforations per square meter. 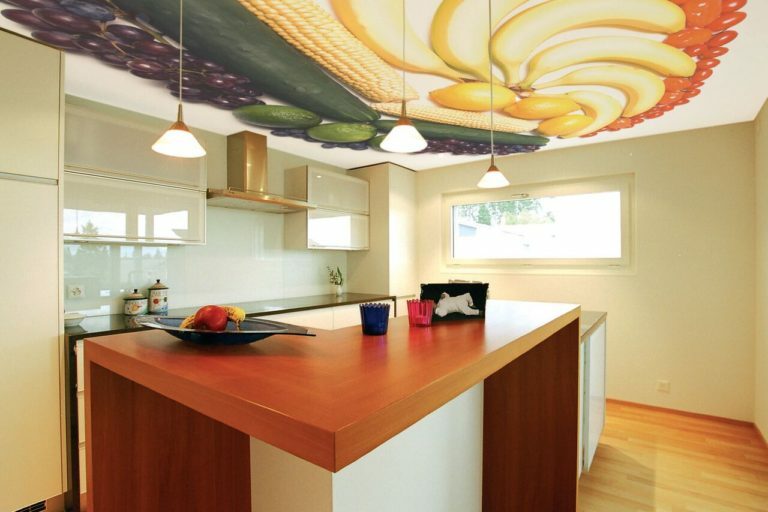 For a radical solution to problems with extraneous noise in the house, it is not enough to install an acoustic fabric. It is necessary to approach this issue in a comprehensive manner. This means that in order to combat the noise, you will need to use additional sound absorbers in the form of panels of porous material that will provide another barrier for sound waves. There are special components for these types of solutions, which, when installed together with sound-absorbing films, significantly increase noise insulation. Acoustic panels made from a thick porous sound absorber are installed behind the stretch ceiling. Their purpose is to reduce the reflection of sound waves in a room. The same material helps prevent the penetration of extraneous noise into the room as well. It keeps outside sounds from penetrating the room, while at the same time stopping sound waves from exiting the space. For the best solution, you can use materials from the same manufacturer, or you can use materials from different companies. There is a large selection of these products on the market. In addition to reducing the noise level, such treatments improve the thermal insulation of the dwelling. You maybe be able to save on heating while you improve the acoustics in the room.